@HPTPoker is at @AmeristarEC tomorrow through May 9 for a series of tournaments - including the opening weekend $100,000 guaranteed Monster Stack and the $1650 Main Event from May 5-9. Take a look at the full schedule above. - Here are the @HPTPoker @AmeristarKC Main Event Results. 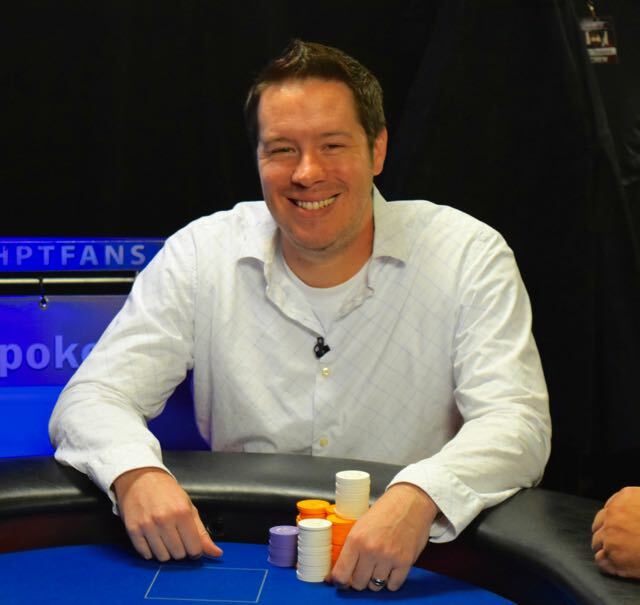 Ryan Gregor makes it 650,000 preflop, Jason Darland moves all in Gregor makes the call. The board runs out 2♥️ 3♦️5♣️ A♣️ 5♦️ and Darland has been eliminated in 2nd place. 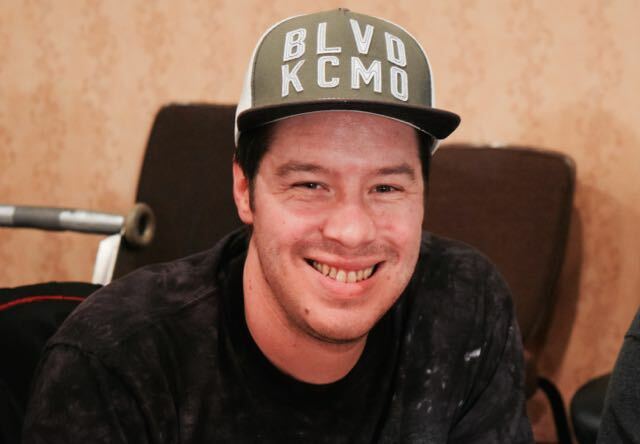 Ryan Gregor bet out 500,000 on a 7 6 2 flop and Jason Darland moved all in. 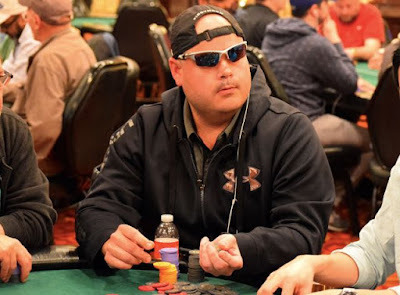 Gregor tanked for nearly 4 minutes before finding a fold and showing TopTop face up, while Darland only smiles and rakes in the chips. The @HPTPoker @Ameristar9-handed Final Table started 12 hours and 10 minutes ago ... welcome to Hour13 ... heads-up between Ryan Gregor and Jason Darland, hand 270 for the day being played now. 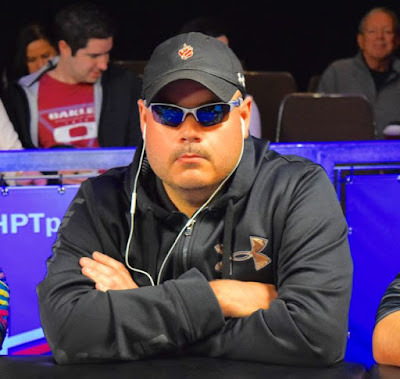 @HPTPoker @AmeristarKC is down to two players - Jason Darland and Ryan Gregor and the players have equal stacks now in the heads up match, with about 5.2 million each. 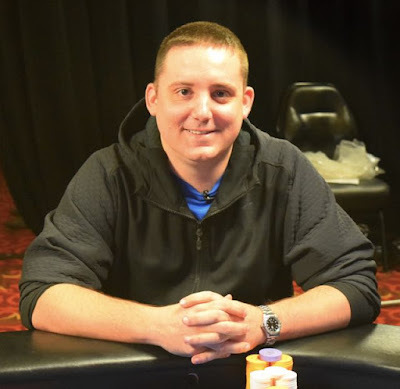 The @HPTPoker @AmeristarKC Main Event is down to its final two players - Ryan Gregor (above) and Jason Darland (below), playing for the top prize of $111,696. 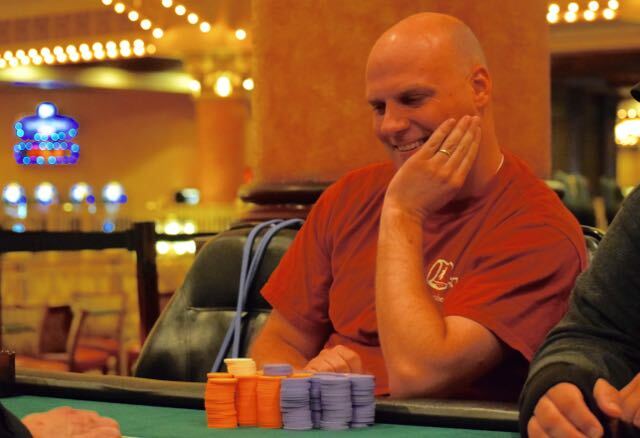 Jeff Wigh is all-in preflop for his last 1,570,000 and Jason Darland makes the call. The board runs out 8 7 A 3 7 and Wigh is eliminated. 3-handed play has gone for more than 2 1/2 hours now. Players are on a 10-minute break. Here are their updated chipcounts. 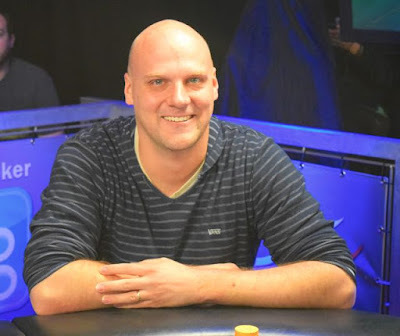 Ryan Gregor leads out, Robert Castiore moves all in preflop and is called by Gregor, who has Castiore covered. The board runs out 3♥️ T♣️ 8♣️ 2♠️ T♠️ and Castiore is eliminated. - The @HPTPoker Main Event from @AmeristarKC is on a 10-minute break. here are the updated chipcounts for the 4 remaining players. Down to the Final Four here @HPTPoker @AmeristarKC, with Ryan Gregor your chipleader with 3,300,000. Mike Vanier started Today's @HPTPoker final table with just 234,000 or 9BB. He doubled up three different times today, and just moved all in again, this time called by Robert Castiore. 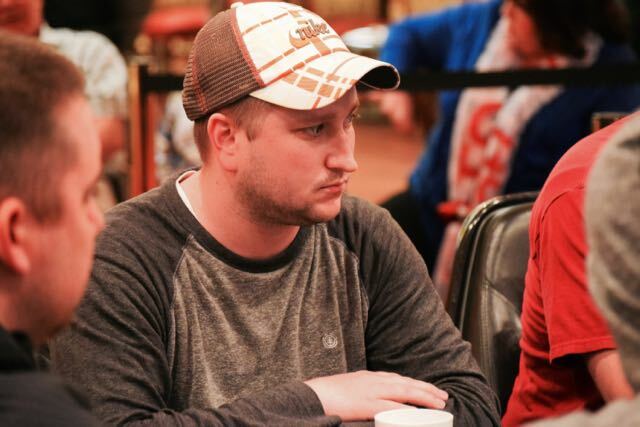 Jay McVeigh is all-in preflop for his last 575,000 and Robert Castiore makes the call from the BB. 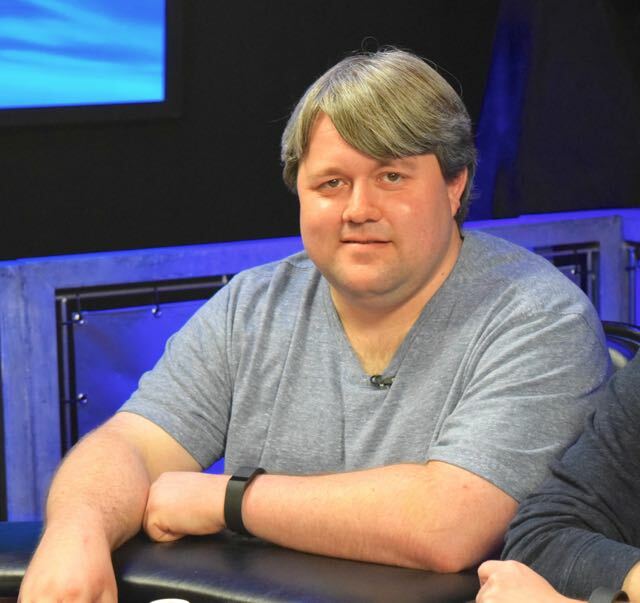 The 9♣️ 4♣️ A♣️ flop gives Castiore top pair and gives McVeigh a flush draw. The board runs out 4♦️ 2♥️ and McVeigh is eliminated. Si Vo is all in on a T♦️ 2♥️ 3♥️ flop and Jeff Wigh quickly calls. 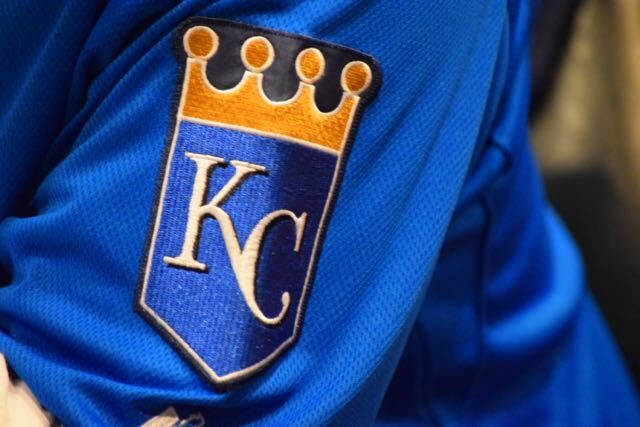 The turn is the A♣️, but the rive K♦️ hits Wigh. 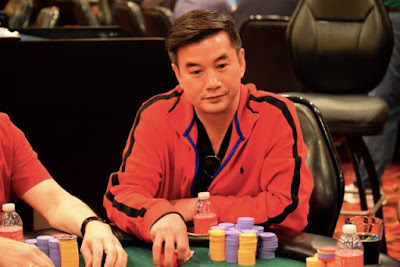 Vo is eliminated and Wigh becomes the chipleader. 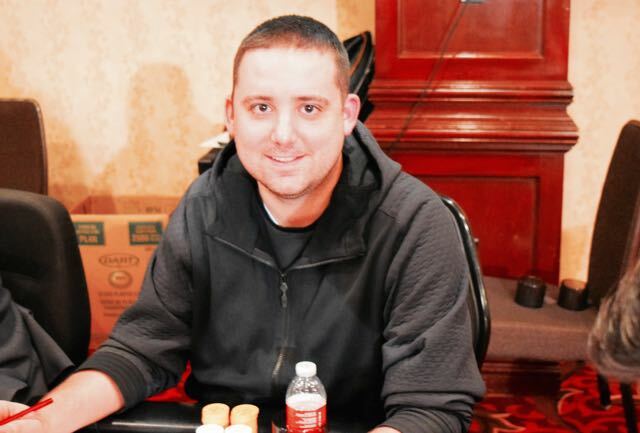 There's a raise to 70,000, then Grant Hinkle moves all in for his last 409,000. Jason Darland asks for a count, then he moves in over the top and all others get out of the way. The 9 5 J flop gives Hinkle an open-ended draw. The 3 turn is no help and the 4 river ends the day for Hinkle. Today's cash, though, moves Hinkle's career earnings to more than 1 Million. 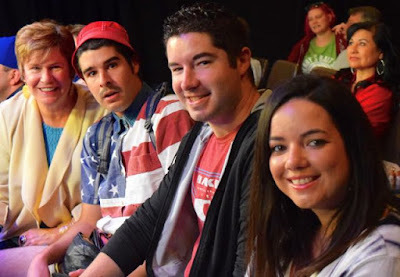 OoooohYeeeah, @MasonHinkle is here today with mom Lynn @2BraceletMom and brother Blair @blur5f6 to cheer on Grant Hinkle at today's Final Table. 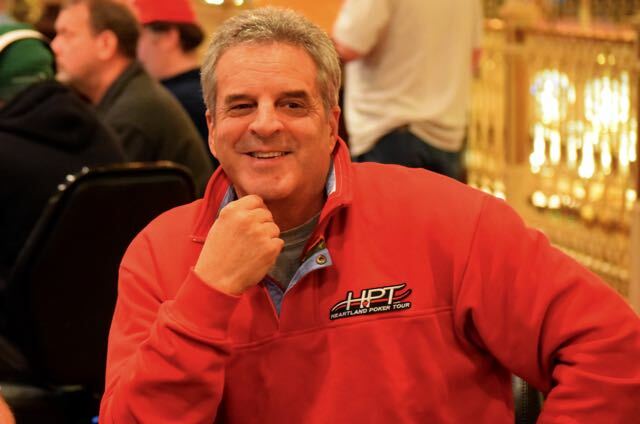 If you're not familiar with Uncle Ron, you NEED to check out the Live Stream at twitch.tv/hptpoker at wait for the "Oooooh Yeeeeah" cheer. 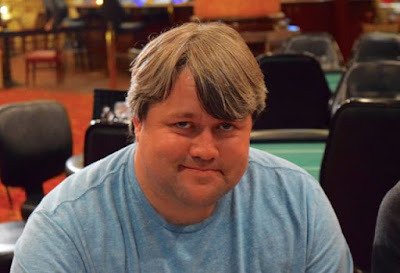 The @HPTPoker Final Table @AmeristarKC has seen short-stack Mike Vanier all in twice so far, and he has doubled each time through Grant Hinkle. 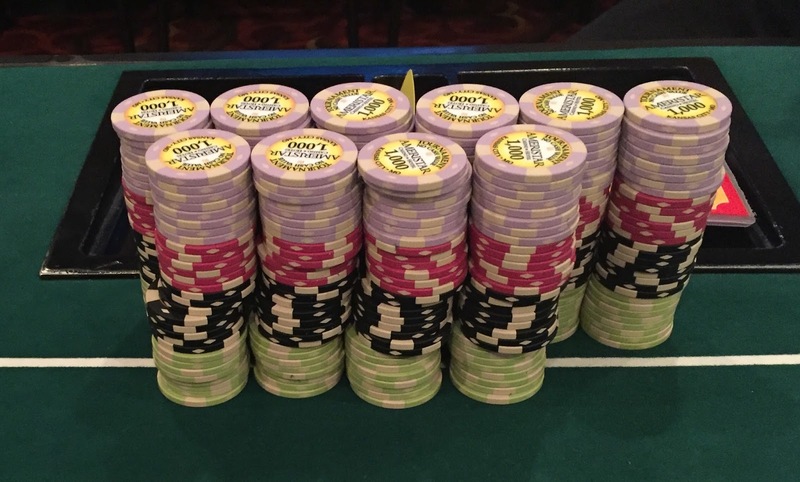 The first double was 55>AJ, the second was QJ>J5 on a J-high flop. Both players are now at about 800,000. 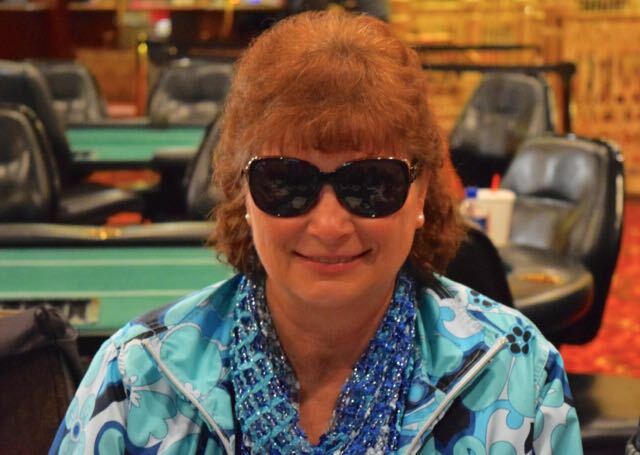 Deborah Phillips is all in on the very first hand of the final table on a T♠️ 2♦️ 4♠️ flop and called by Jeff Wigh. THere's the 8♠️ on the turn to complete the flush for Wigh. The A♥️ brings the end of the day for Phillips after just one hand. Player introductions is taking place now so we're not far away from the start. 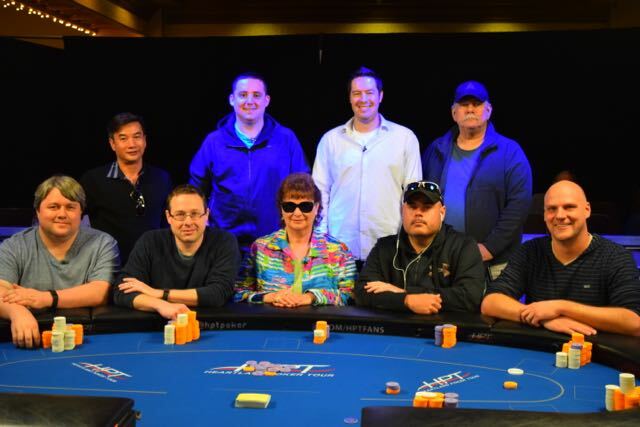 We're just about ready for the final table of the @HPTPoker @AmeristarKC Main Event. 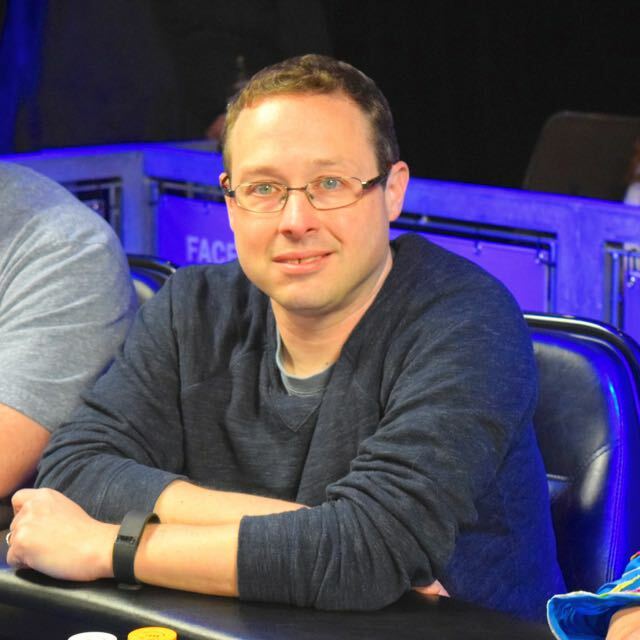 LiveStream with a delay for the event at twitch.tv/hptpoker. No Spoilers via our "Live" updates, we'll only post once the action has gone out over the LiveStream. Players are just taking their seats and getting ready now. 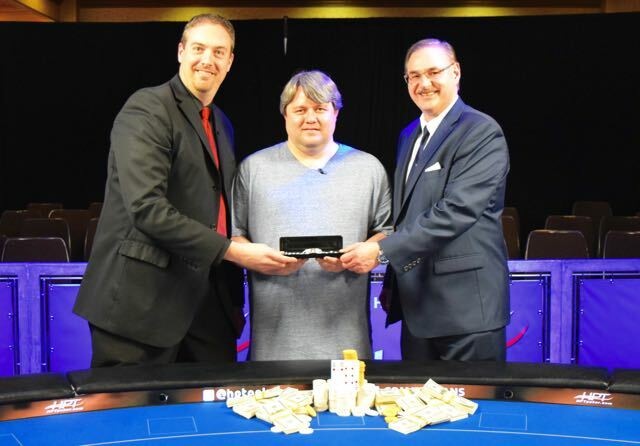 - Here are the @HPTPoker @AmeristarKC Main Event Payouts for 10-18th Place. Ray Dehaharghani ran 88 into the AK of chipleader Ryan Gregor preflop. There's a K in the window, another on the turn, and Dehaharghani is eliminated in 10th place, closing out the night and securing the remaining players as the Ameristar Kansas City Final Nine. 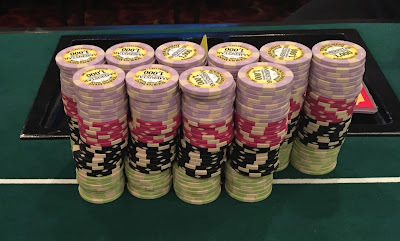 We'll have official chipcounts for y'all in about 15 minutes. 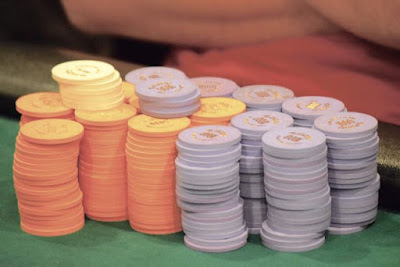 Here are the final 27 players in the Main Event, with their new seat assignments and chipcounts. Joey Brown final-tabled here in August, and he missed today by 2 spots, busting in 11th place. We're at a redraw for the (un)official final table of 10. One more elimination tonight at we're set to start filming at Noon Monday with The Final Nine. 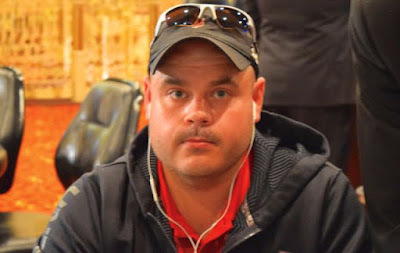 Three players - Joey Brown, Deborah Phillips and Mike Vanier - all have 15BB as the three short-stacks with 11 players left. We are two eliminations away from the end of the night and tomorrow's TV Final Table of 9, so at LEAST one of the short-stacks is going to get through. Ed Sebesta is all in preflop and he's called by Grant Hinkle. The first 4 cards are all spades, neither Sebesta nor Hinkle has a spade so Sebesta has a shot at a chop, the 2 river is black, but a club, and Hinkle has Sebesta covered by about 100,000. 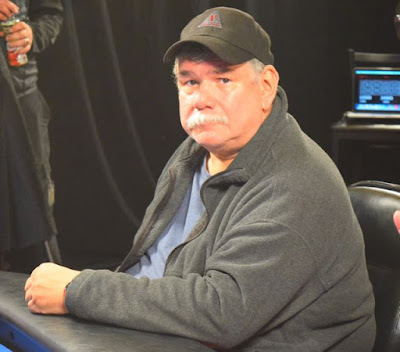 From Gerald McVeigh scoring a huge double up with a set of queens to Mike Rieck and Andy Ernstein being eliminated, there's been a lot of movement in the last 15 minutes. McVeigh doubled through Ray Dehaharghani with his QQQ to 2nd in chips with 1.5 million with 12 remaining. 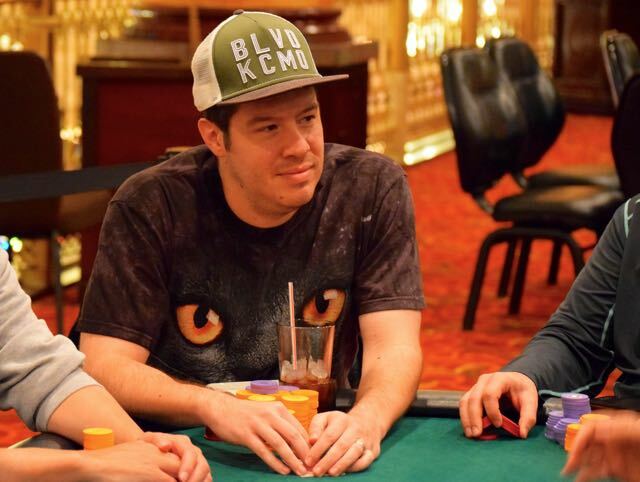 Ryan Gregor has been killing in since dinner break, all the way up now to 1.8 million. - Here are the @HPTPoker @AmeristarKC Main Event Payouts for 19-27th place. Greg Raymer's Main Event has come to an end in 16th place as his AQ < QQ all in preflop against Gerald McVeigh. 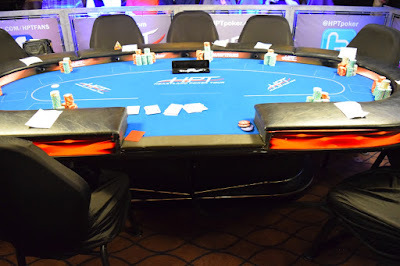 One table to be eliminated and we're done for the night here at Day 2 in Kansas City. Well, less than that as we lost two players while I was writing up this map of the seat assignments with 18 left, so we're down to 16 now. Craig Casino moves all-in for his last 257,000 over the top of Gerald McVeigh's 50,000 lead-out on a 9♣️ 2♦️ 8♣️ flop. McVeigh thinks for a long time before finding a call. 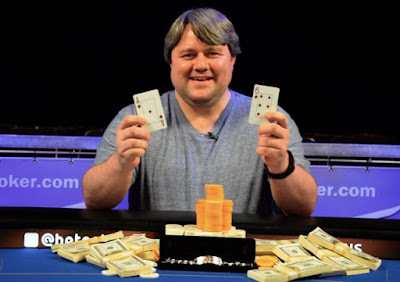 The board runs out 3♠️ Q♦️ and the HPT all-time money leader adds an additional cash of $4,371 - his 24th HPT cash. 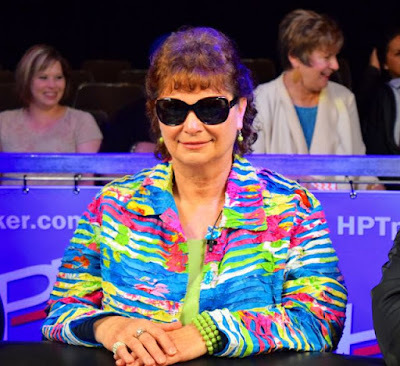 We lost Carolyn Redman two hands later and we're down to 2 tables in the Main Event, 8 away from the end of the night. Time to take an hour-long break for dinner for the remaining 19 players in the Main Event. Here are their updated chipcounts. 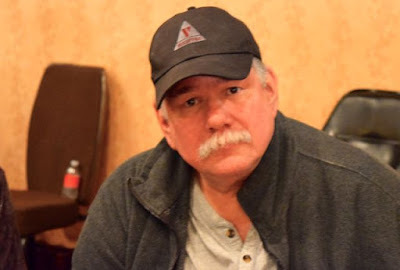 A few hands after we post about @CraigCasino1 troubles today and we see him move all in for 123,000 over the top of the 40,000 raise by Ed Sebesta, who snap-calls. The board runs out 3-T-6-A-5 and Casino gets a double. 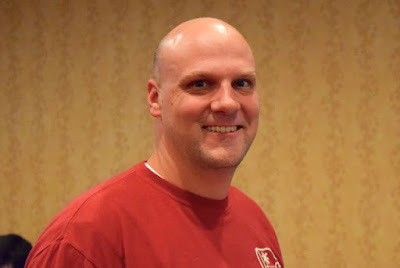 @CraigCasino1 had his aces cracked about an hour ago, and has found few chips coming his way ever since. 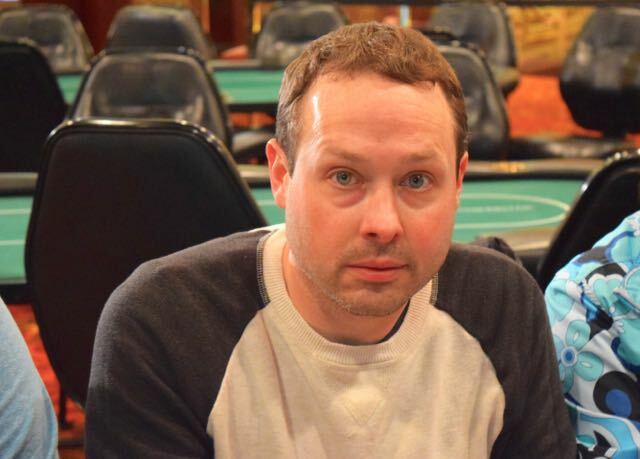 He just moved all in preflop from the SB to pick up a pot and get up to 145,000. 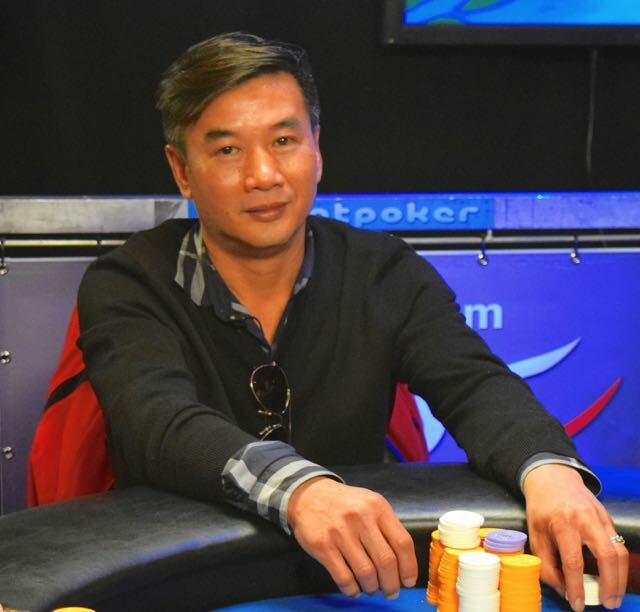 After a series of preflop raises building the pot to 200k, Anthony Faulkner adds an additional 149,000 as he moves all-in, and Si Vo finds a call. The board runs out 5-K-9-3-3 and that's at least four knockouts today for Vo. 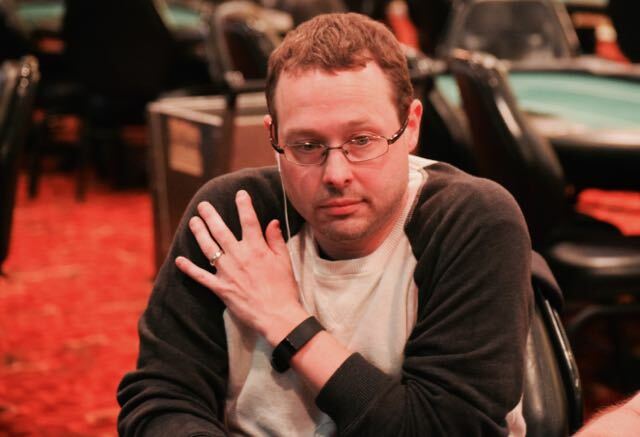 Greg @Fossilman Raymer leads out for 26,000 UTG, Ryan Gregor calls and Mike Vanier moves all in for his last 172,000. Raymer asks for a count, makes the call and Gregor gets out of the way. There's groans from the table as a 5 pops in the window, the rest of the flop running out J♠️ K♠️. Raymer hits his set. The turn is a J♦️, Raymer improves to a boat, but that's the A♥️ on the river .. boat-over-boat and Vanier gets his double.